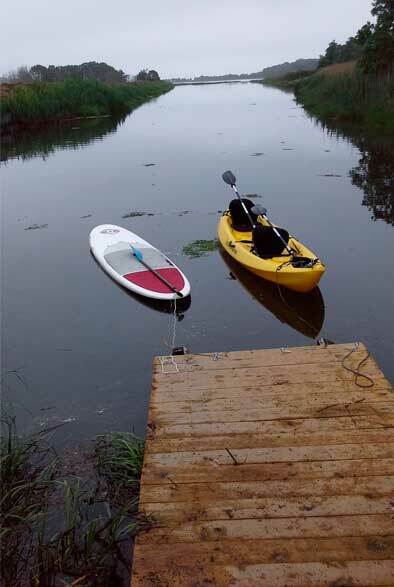 Right from our very own dock on West Creek adjacent to the 9th hole – a perfect North Fork location for both beginner and experienced paddlers. Free parking and plenty of rental Kayaks and Paddle Boards, or launch your own with no parking permit required. This unspoiled location provides direct access to all of West Creek, Kimogeners Point, and New Suffolk Bay and offers abundant views of marine, fowl and wildlife. Kayak and Paddle Board storage and launch site also available. Please call or visit us in Cutchogue, at Cedars Golf Club to reserve a Kayak or Paddle Board or book a combination Golf and Paddle package. For Kayak & Paddle pricing information Click here. FOR A LIVE MAP - PLEASE VISIT OUR CONTACT PAGE. 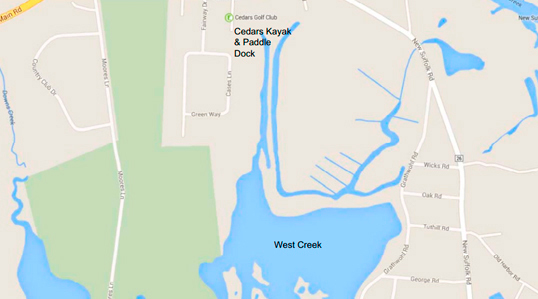 Cedars Golf Club is the best location on the North Fork for paddle boarding, Kayaking and/or launch site open to the public!